December 7th, 1992 was a milestone day for Momiji Health Care Society. After 14 years of building and fundraising, the Momiji Seniors’ Residence finally opened as the first supportive housing seniors’ residence in the Japanese-Canadian community, welcoming a record 170 tenants in the first few months. These early tenants were a youthful average age of 75 years. They played tennis in the auditorium and ping pong in the residents’ lounge; they planted and looked after the beautiful gardens, the store, the library and the reception desk. A security system was put into place with night patrol and fire wardens. This year Momiji is celebrating our Seniors Centre’s 25th anniversary and the average age of our tenants is now almost 90 years. Our tenants have remained independent an average of 10 years longer than any other supportive housing facility in Ontario. Over the years, close to 400 tenants have been able to call Momiji “home” and have “aged in place”. Incredibly, eight of our original tenants still call Momiji home. As you can imagine, the care needs at 90 years of age may be more complex than at 75 years. At Momiji, security checks, transportation, reminders for meals, activities and medications, are vital parts of everyday life. Meals, social and education activities and even the availability of an on-site family doctor and nurse are essential to wellness and quality of life. Similarly, outside of our Seniors Centre, seniors are aging in their homes and their care needs are changing. Our community programs, like friendly visits and dining and education, enable us to reach out and stay in touch with lonely and potentially isolated seniors in the community. This allows us to bring Momiji’s focus on seniors’ wellness to the broader community. Year after year, our Support Services and Community Services departments have seen dramatic increases in demand and costs for all activities. Despite these changes, we remain steadfast with our commitment to offer respect, dignity and independence for seniors. Although we receive some government funding, our increased care demands and outreach programs have received no additional funding. Since we cannot continuously do more with less, not surprisingly, our need to raise funds has increased. Your gift today in celebration of our 25th anniversary will help ensure that Momiji’s next 25 years gets off to a great start. 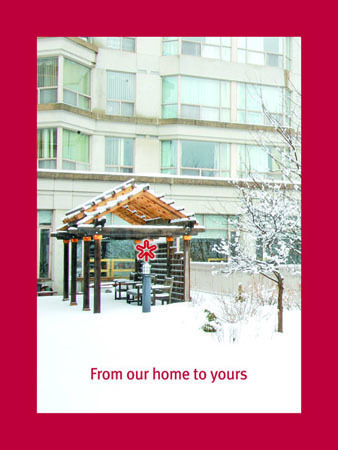 On behalf of our Board of Directors, our staff and volunteers, we wish you and your family a very happy holiday season and all the best for 2018. P.S. If you would like to make a donation, you can do this online (just click the Donate Now button) or send in a cheque to the address above. Thank you!